Have you always dreamed about an expansive walk in shower, adorned in warm travertine, or gorgeous granite, or recycled glass tiles equipped with multiple shower heads to soothe those tired muscles and wash away the stress of the day?The master bath has been coined the soul of the home. Its your sanctuary your place to get away from it all and relax in your whirl pool tub. As you sink deeper into the bubbles, the moist air fused with lavender slowly peels away the physical and mental pressures of the day. The soft glow of the candle light helps wash away any remaining tension in your bodyand you relax into a state of pure contentment. 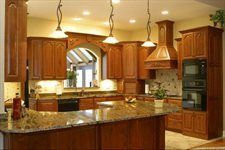 So whether youre looking for the straight-forward face lift with a new vanity and new counter or looking for a new master bath retreat, a Houston Granite and Flooring designer can help. Our designers work with premium products such as granite, Corian, tile, cultured marble vanity tops and tub/shower surrounds, custom cabinetry and an extensive array of faucets, fixtures and hardware. Your Houston Granite and Flooring remodeling team will take care of every aspect of your dream space makeover: from design, to custom cabinetry, to plumbing and fixtures, to electrical, to lighting, flooring and more.